We woke up to our alarm at 4am and high tailed it out of bed. We packed everything up, did our prep and headed to the launch area. The road to the launch area was easy to miss at night so there was a lot of confusion about where to launch. I knew there was a day-use area that was perfect to launch at and so I kept looking till I found the road. As we setup the kayaks I realized that my kayak lights weren't working. It was then that we realized that we'd used the wrong battery with the lights meaning I wouldn't have lights this morning! I was disappointed as the lights are kinda my thing. lol But I got over it and focused on getting everything setup. 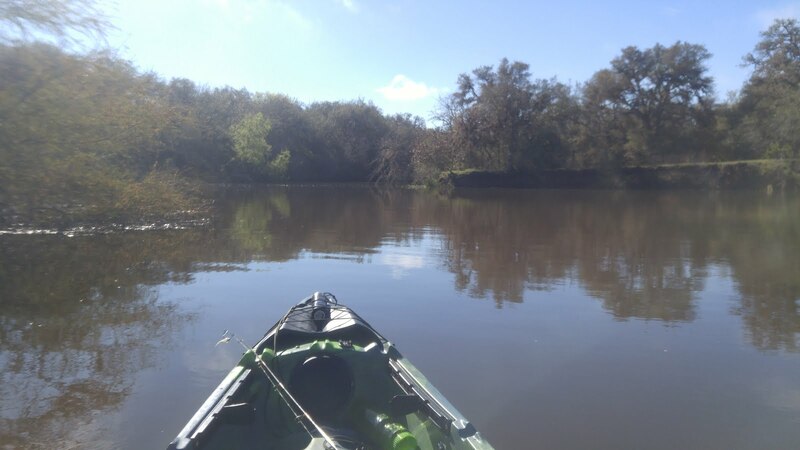 We got the kayaks down to the water and then headed back up for the captain's meeting. 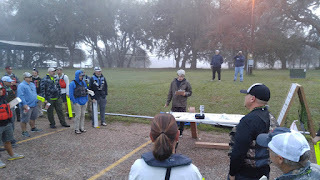 Launch went well and we were off into the fog. It was quite foggy that morning but it made up for it in fairly calm winds. The air temperature was in the 50's to start but warmed to the mid 70's by noon. The water temperature was around 68 degrees in most areas and warmed to around 71 by the end of the tournament. The water up the creek was chocolate brown. It was much clearer near the main lake. So with these good conditions, it was little surprise that fishing was better. However, for me, I didn't catch anything early in the day. For some reason even though the conditions were perfect, the bass were not biting on the surface or just under the surface. The only thing I didn't try was a worm. I should have since others seemed to be using them. Around 10:15am I found a lay down (a tree hanging into and) over 3-4ft of water. I knew this was perfect buzzbait territory and started casting. Wasn't long and I had a fish on. Got it all the way to the boat and started to pick it up and it was gone. It was a tournament fish too. Quite frustrating! A few minutes later I latched on to something significantly bigger. This one had control of my little ultralight rod. In fact, it managed to get hooked up on a stump and the line got stuck in the bark so I couldn't get it off. I fought with it until I realized I couldn't get it free... so waited for the bass to swim back around the trunk. Once she came back around, it popped loose and I pulled her in. She was a 20.5" 4lb beast. Still not big bass territory but it felt good to actually catch a "real" fish. I kept fishing that lay down for another 30-45 minutes but didn't get any more bites. So I left that part of the cove and headed around the bend to another cove. This was looked to be too shallow, but near the back I found a stand of trees in about 3ft of water. I fish around it for about 20 minutes before I got behind it and parked myself on shore. I kept casting into the stand dropping my lure right next to the trunks and pulling it in. The method paid off and I finally got a small 13" bass. I knew there had to be another bass in there though so kept at it until I got hit by a 16" bass. The cove appeared to have more opportunity, but I couldn't locate any more bass. That was pretty much it for me! 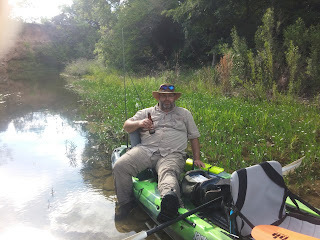 I fished other coves and even tried doing some trolling in the middle of the lake. But I couldn't locate any more fish. I didn't even find them on sonar. I found out later that many fish when up river about 2-3 miles. This area was where most of the fishermen were that actually limited for the day. All in all, it was a good day though. Had I brought in that 3rd keeper I would have had my best score so far at KATS. Over all though I still gained over 10 places on the roster so I'm guessing some of these guys either didn't show up or didn't catch as many. This means I'm about 15 places from being able to go to the Classic championship. If I do well at the next 3 events, I may actually have a chance! So am I still excited about KATS? Yes, reality has set in and I'm very much aware that my skills as a river fisherman are not as relevant as I had hoped. But I seem to be holding my own as well. I'm certainly not being skunked and I'm sitting very solidly above the 50th percentile. Not as good as I wanted, but I really can't complain. As time goes on I'm certain my lake skills will improve and I'll start placing higher in the ranks. For now I'll need to keep learning and trying to out-guess my competitors and most certainly out-smart a few more fish!